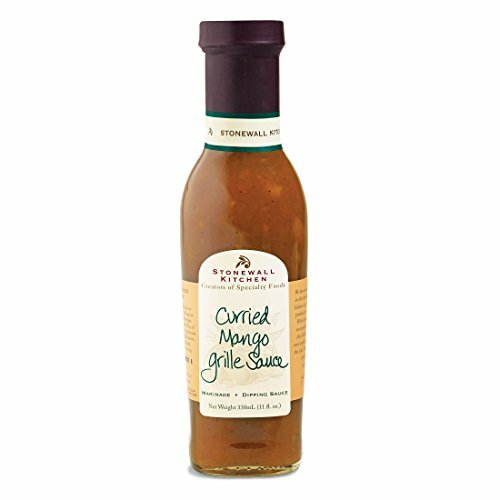 Stonewall Kitchen Curried Mango Grille Sauce, 11 Fluid-Ounces Grab your passport and pack the flavors of the Caribbean with this versatile Curried Mango Grille Sauce that adds a savory flavor enhanced by the mellow, sweet mango, to grilled vegetables and meats. Great when used as a dipping sauce for shrimp or other appetizers, or to accent your favorite chicken, rice or vegetable salad. Gluten-free and Made in the USA About Stonewall Kitchen Founded in 1991 by partners Jonathan King and Jim Stott, the two established themselves selling jams and jellies at local farmers’ markets, fairs and festivals with their flavorful line of distinctive and high quality food items. Over time, they expanded their product line to include sauces, condiments, mustards and baking mixes. Today, products are sold in more than 6,000 wholesale accounts nationwide and internationally and through the company's 10 retail company stores and catalog and web divisions. Stonewall Kitchen is the winner of 28 prestigious awards from the Specialty Food Association and is a three time recipient of the coveted Outstanding Product Line award.